I’m going to share with you one of the most valuable tools you can add to your hunting arsenal this year, and it’s FREE! Biggamelogic.com (BGL) is best described as a mapping program, hunting journal, data organizer, and social network all rolled into one package. Though it sounds complex, the website is actually pretty “user friendly.” BGL basically gives hunters the same tools that biologists use to create basic home range maps and sort through data to discover important patterns. As a hunter with a strong background in biology, I recognize that such tools are EXTREMELY valuable for hunters! For example, if you want to pattern a specific buck, you can use BGL to record all of your observations of that animal (trail camera photos, personal sightings, etc.) and the website will produce a basic home range map. Great! Now you know the different portions of the property the deer uses. So how do you put yourself in position for a shot? 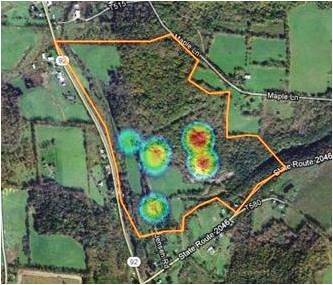 Using BGL’s searching tools and some basic knowledge of deer behavior you can get a better idea of where to locate your stand. With the exception of the rut, bucks are generally bedded down throughout the middle of the day. If you know where a buck is bedded during the day, you can sneak into position in the early afternoon while he is bedded, and hopefully intercept him on his way to a food source in the evening. Assuming that mid-day observations occur within or nearby bedding areas, you can use the BGL searching tool to filter through all of the observations of the buck and map just the mid-afternoon observations so you can get a better idea of where his bedding area is located. 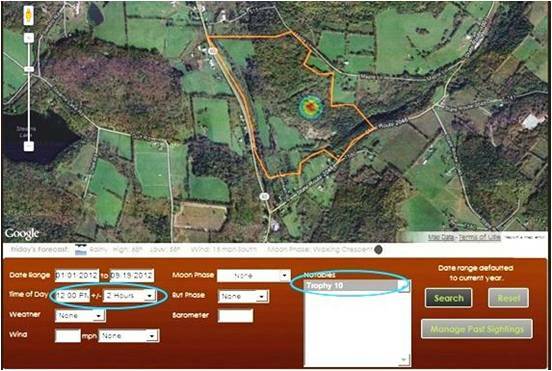 After mapping the likely bedding area, you can use a similar search to map the deer’s evening feeding area. Once feeding and bedding areas are known, you can plan for the wind and select a stand location in a travel corridor between his bedding area and food source. Pretty cool, huh? I think so! BGL also just recently released a low cost App for smart phones which uses the GPS component of your phone so you can add data to your BGL map directly from the field! So for $4.99, you can basically turn your smart phone into a GPS unit and mark stand locations, deer sign, food sources, sightings, etc.! This is not only a “MUST HAVE!” app for sportsmen, but it is also useful for a wide range of outdoor enthusiasts and wildlife professionals. In the upcoming months, I will be working with BGL’s web designers to help fine-tune the website and further illustrate the many uses of the app and website. BGL is probably the most useful thing to hit the outdoor community since the trail camera, so check it out and add it to your hunting arsenal this year!